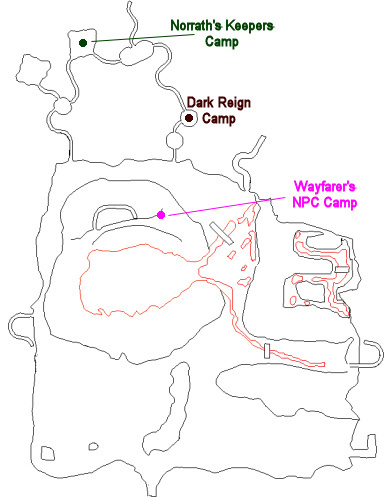 This raid task begins with Captain Areha Burina (click for map image) in the Norrath's Keepers camp of the Lavastorm Mountains. You have been assigned the task 'In the Shadows'. Terrible events came to pass as Yar`Lir was taken from her perch. There was a dragon that protected the Nest beneath the islands in the sky, but now that place has turned to ruin and darkness. After seeing the effects the corruption has caused the Nest, we can only guess what has happened to the dragon that inhabited it. Go now and be swift. If this dragon is a plague on our lands, it must be stopped. At about 75% health, 4x "incorporeal shadow" spawn. These don't hit hard at all and have relatively few hitpoints. If killed, a "lifedrain shadow" spawns in its place. The lifedrain shadows hit for a max ~2,000 and flurry, so you want to avoid killing the incorporeal shadows if you can. 3-6 minutes after Vishimtar is initially aggro'd and every 75-120 seconds thereafter, a "tainted egg" spawns at a random location. If these aren't killed within a few moments of spawning (blunt-weapons only), multiple mobs called "a corrupted drakeling" spawn from it and attack. These hit for a max ~1,200 and flurry. At 50% health, the four "corrupted drake" mobs around the room go aggro. These are snareable and, if killed, immediately respawn. The mournful spirit draws corruption from your body and absorbs it, destroying itself in the process. For each cure of "Creeping Doom", Vishimtar's health unlocks 1%. If anyone dies or goes linkdead at any time in the event, "a spirit wraith" spawns in their place. These skeletons hit for a max ~1,500; have zonewide aggro; and are mezzable (note: pet deaths don't spawn adds). Note: Throughout the event, you'll sometimes get a "cloud of concentrated chaos" spawn. You can kill these to fill up everyone's health and mana. Vishimtar the Fallen has been slain by _____! Vishimtar crumples. His corrupted form no longer casts shadows upon the cavern walls. Your faction standing with Vishimtar has been adjusted by -1. Your faction standing with Cursed Drakes has been adjusted by -1. Vishimtar's feeble attempts to protect the Nest were no match for your prowess. Following Vishimtar's death, all adds despawn and a chest spawns with loot. Vishimtar himself drops 9x "Shadowscale of Vishimtar" (Tier 5 progression item) + 1x "Eye of Vishimtar" (turn-in item for a mask). Note: If doing this raid as part of progression, you'll want to check in with some NPCs to make sure your flags are up to date. See this quest entry for more details. If doing this task through the Norrath's Keepers, see Lieutenant Ekiltu Verlor. If doing this task through the Dark Reign, see (who?). Actually, the task is available from Captain Areha (Norrath's Keepers) or from General Lereh (Dark Reign). Shared task locks upon entering the event area proper -- merely standing on the approach ramp does not lock the task. Vishimtar the Fallen has been slain by Tobynn! Your task 'In the Shadows' has been updated. You have received a replay timer for 'In the Shadows' : 4d:19h:15m remaining. You have slain the corrupted dragon. Vishimtar's shadowy form is now only a sad reminder of how far the noble dragon had fallen. You have been given: Norrath's Keepers Token. You have gained 9 Radiant Crystals. -April 5, 2014.. what a joke..
plan was to have mage pet tank vish, i was gonna kite adds on SK. sent the mage pet in, casters began there burn. BOOM, vish dead in 12 seconds, task complete, everyone got credit and could loot the scale. not sure if the mage pet tanking had anything to do with bypassing it, or the fact that the mages burned and did insane damage and just burned Vish down instantly, but, yeah, it was insanely easy, no emotes no triggers no nothing. Can confirm this. Did this quest today on 7/9/2016. All characters 105. Sent pets in to tank, cast manaburn on Wizard burned down Vishimtar very fast, ignored all adds and the dragon was dead in 10 to 15 seconds with no health locks at all. Okay, did this on April 5, 2014.. what a joke.. If anyone dies, or goes linkdead, at any time in the event, a spirit wraith (mezzable; hits for ~1500) will spawn in their place (this does not include pet deaths). If you keep the LD person healed until they leave the world, you will not get a Spirit Wraith spawn. This task is off of Captain Areha Burina, who's chillin over by the fire. It is a 6 hour time limit not unlimited. It also locks when the first one steps on Vish platform, so if some nosy gnome go up "to have a look" before all are taskadded you need to quit task and make new. Also, if you wipe and some log off before next try you can't get more peeps in; you must all quit task and make new one. Also, have some resser bind outside in case of wipe. Thats quicker because if all quit exp and wait outside it will take 30 minutes for the task to punt the corpses.